We first learned about singer, songwriter and drummer Kiki Kyte when she appeared on the hot 2015 dance single and video “Good Time,” from Sumthin’ Like This, the third album from the great European production teams, Cool Million (Rob Hardt and Frank Ryle). It was an auspicious introduction to Kiki, and she sang the heck out of it. It was also the logical next career step for the Carolina born, Los Angeles-based performer. Kiki Kyte was raised in the Southern US and, like many singers, she began in church, performing in choirs beginning at age five. But her family’s love of varied musical styles also shaped her, giving her exposure to everything from rock to country to funk. She was encouraged by both her family and her childhood musical director, who told her “You will do great things” That became an inspiration for her to follow a path into a lifetime of music. As a young adult, Kiki moved to Los Angeles, where her love of Southern musical sounds mixed with her evolving passion for the energy of the city. And she brought with her a diverse, upbeat style that she carries to this day as a musical free spirit. With a growing repuation as a singer and musician, she toured with Chaka Khan and began working with several popular acts, including The Mary Jane Girls, Evelyn "Champagne" King and Klymaxx. But by 2015, Kiki was ready to move 20 steps forward to the front of the stage. Over the course of the next year she collaborated with the Cool Million team on a to-be-released debut dance EP. 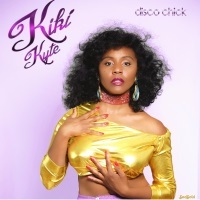 The first single from that EP, “Disco Chick,” was released in July, 2016 and gave a feel for both the sense of melody and the sheer fun that the artist brings to her work. We can’t wait to hear more.